A simple icebox cake made with graham crackers, chocolate fudge pudding, and miniature marshmallows. This cake is topped with toasted marshmallows, chocolate curls, and graham cracker bits. A delicious dessert that takes less than 20 minutes to prepare! A bunch of bloggers and I have all teamed up to bring you a whole week of delicious summa-time treats in the form of S’mores. But, let’s be honest, I’m totally one of those people eating S’mores in the middle of December. Because they are that good. To kick off this week, I decided to start with a super simple (and way yummy) icebox cake – S’mores style. These bars aren’t the hot, ooey-gooey, just pulled-the-marshmallow-out-of-the-fire kind of treat, instead they have all the great flavors of S’mores (ooey gooey marshmallows – check, lotsa chocolate – check, graham crackers – check) without the use of a campfire. Or even an oven. That’s right, this icebox cake is NO-BAKE! All it is – a little bit of layering. Layer graham crackers, then the pudding and marshmallow mix, more graham crackers, and more pudding. On top of it all goes some whipped topping and then it chills for about 5-7 hours in the fridge. I wasn’t kidding when I was saying less than twenty minutes prep. This dessert is as easy as they come. Whisk together the pudding and milk until combined. Place in the fridge to set up for 5-10 minutes. Cover the bottom of the lined pan with graham crackers. It will take five graham crackers per layer (you will need to break some up). Make sure that graham crackers completely cover the bottom. Remove the pudding and stir in 1 and 1/4 cup miniature marshmallows. Pour half of the pudding mixture over the graham cracker layer. Create another graham cracker layer on top of the pudding. Pour the remaining pudding on top of the graham cracker layer. Place a final graham cracker layer on top of the pudding. Spread the thawed whipped topping on top and place in the fridge for 6-8 hours or overnight. OPTIONAL STEPS: To create chocolate curls, make sure the chocolate bar has been at room temperature, unwrap it, and “peel” it with a vegetable peeler from top to bottom directly over the top of the icebox cake. *To toast the marshmallows spread the remaining 1/4 cup on a parchment lined baking tray. Preheat the oven to broil (temperature of 550 degrees F). Place the oven tray at the top and put in the marshmallow pan leaving the oven door slightly ajar. Watch the marshmallows carefully and pull out when lightly browned. Allow to cool and then pull off and place on icebox cake. 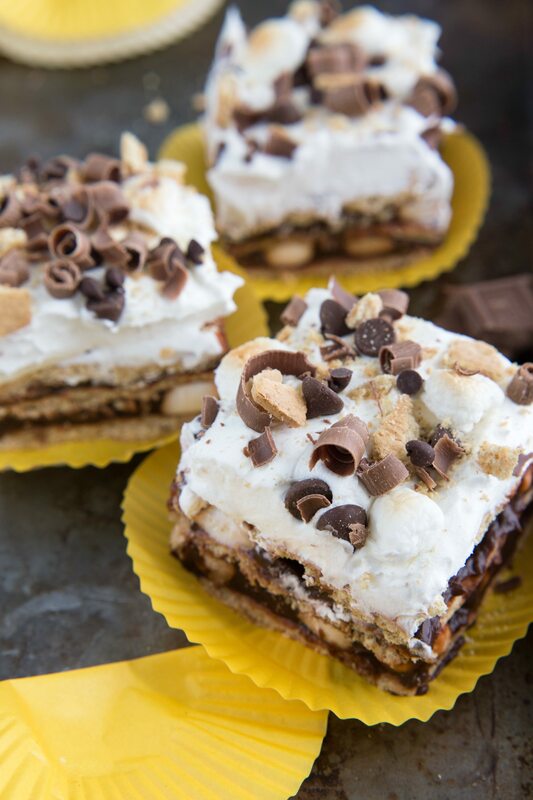 LOVE this s’mores icebox cake! So easy to make, so creamy, so cold, what’s not to love?! My mouth fell open when I saw this, Chelsea! I am in love with s’mores anything and I’m so excited about this s’mores week! This icebox cake looks wonderful and it’s full of all my favorite things. 🙂 Pinned! 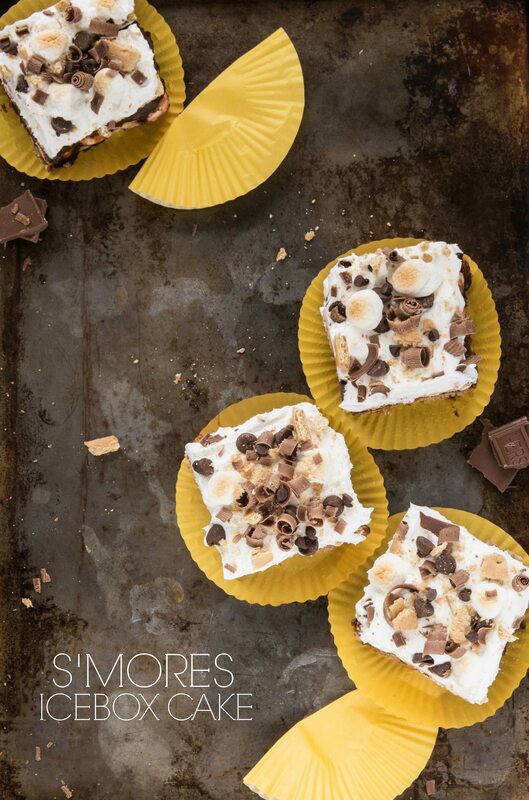 Yup, I agree – I am totally that person who eats smores anytime of the year! This looks awesome – I mean you just cannot go wrong! Happy Monday! We love s’mores any time of the year. I love this version! It looks so delicious and decadent! I think these are the prettiest smores will ever get, haha! Delicious! Love this! No bake, 20 minutes, and no campfire? I’m in! Great idea Chelsea. When are s’mores not a good idea? I just love ice box cakes, and this looks amazing! 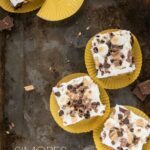 I love icebox cakes and this s’mores version looks amazing! No bake heaven! Yum! 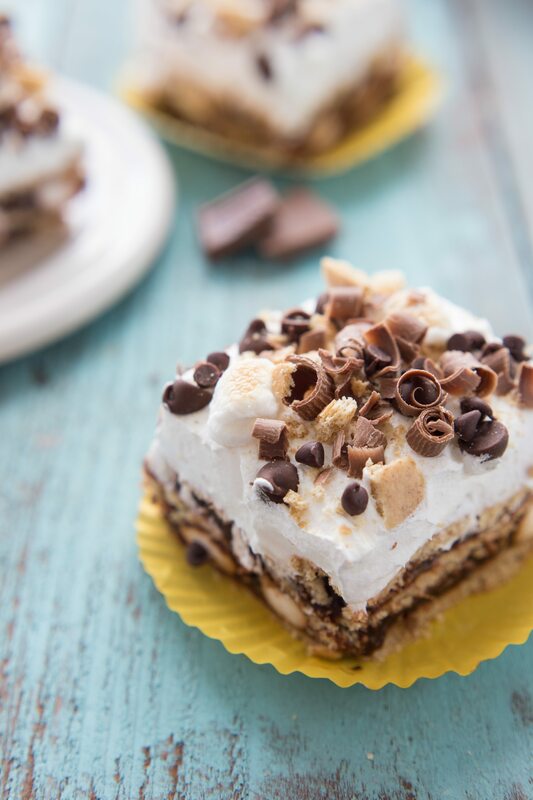 S’mores desserts are hard to beat and this cake looks fabulous! I love that it’s easy and a great way to cool off in the summertime! These look delicious Chelsea and I absolutely love that they are no bake! Yum! I’m loving all these smores recipes. This looks absolutely divine! I could eat smores all the time! Wow! Less than 20 minutes to prepare and no-bake? Can we just skip dinner and head right to dessert?! Yayy for s’mores week!!! Icebox cakes are so wonderfully simple and delish-and this one is incomparable! I want a piece riiiiight NOW! I don’t know if I am going to survive S’mores week. Gad everything is just shouting at me, Eat Me. Eat Me. Normally I don’t have a camp fire, so I am safe. But these by pass the camp fire. Heaven help me. Plus I adore ice cream anything. Yummers! These look and sound delish, Chelsea! I’m loving all these S’mores recipes! What a fantastic no bake treat for the hot summer days! A great twist on a classic! Looks delish! I love the redesign – It matches your blog perfectly! What a delicious and beautiful cake my friend! I just made some homemade graham crackers and now I have great new recipe to use them in! I’m totally one of those people eating a s’more in December too! 🙂 And this s’more cake looks out of this world good!! Great job, girl! I love ice box cakes- so great for the summer!